Health & BeautyTested Anti-Estro - 120 kaps. Zaawansowany preparat, którego każda porcja dostarcza do organizmu solidną dawkę naturalnych substancji aktywnych! Formuła bazuje na rewelacyjnym ekstrakcie z korzenia Ashwagandhy o standaryzacji na zawartość aż 7% witanolidów. Wpływa pozytywnie na cały organizm, wzmacnia odporność oraz poprawia koncentrację. Sięgnij po naturalny produkt w dobrej cenie! Sport Definition Essence Betaina + Pepsyna - 90 tabl. Czysty kwas alfa-liponowy bez zbędnych dodatków? Tak, to możliwe! Każda porcja dostarcza do organizmu aż 600mg ALA, co stawia go w czołówce tego typu suplementów. Usprawnia detoksykację, i nawet wspiera nieuaktywnianie wolnych rodników. Najwyższa jakość w dobrej cenie, na wyciągnięcie ręki! Sport Definition Essence Bacopa Monnieri - 90 tabl. Tested Anti-Estro - 120 kaps. 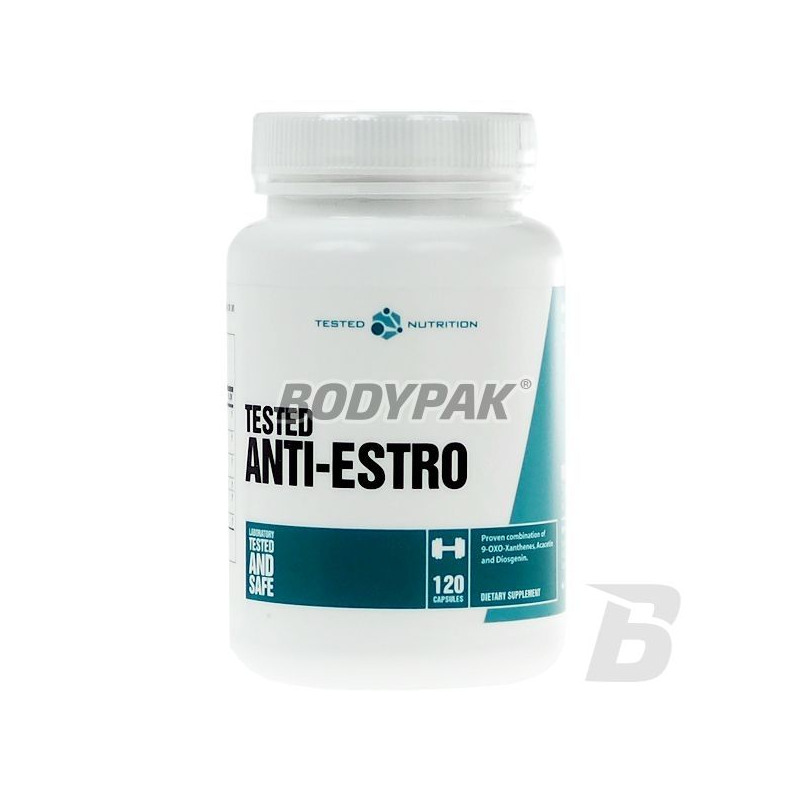 Tested Anti-Estro is a supplement containing a complex of blocking the conversion of testosterone to estrogen. Supplement Tested Anti-Estro is estrogen blocker highest quality. The present formulation contains Garcinia mangostana - source 9OXO. Brassicasterol has Stigmasterin and by which the testosterone level rises naturally It is also composed of plant extracts, which provide steroid saponins and block the conversion of testosterone to estrogen. It is a supplement so that you build quality lean muscle tissue. Swanson EFAs Super EPA - 100 kaps. The product is a source of Omega 3 fatty acids and a high concentration of EPA and DHA. Dietary fiber, also known as fiber tract, belongs to this part of the food of plant origin, which although is not digested by the human digestive system plays a very important role in the smooth functioning of our body. Health is the basis! Nutrafine Phosphatidylserine - 100 kaps. Ginkoflav Forte - It is highly concentrated extract of Ginkgo biloba (ginkgo biloba) containing highly active substances of natural origin, affecting the proper functioning of the nervous system. Swanson Lecithin Non-GMO 1200mg - 180 kaps. Lecithin is an excellent dietary supplement that not only improves memory and concentration, but above all it is necessary for the proper functioning of the nervous system. Tania lecithin brand Swanson regulates cholesterol levels, supports liver and slows the aging process. UNS GABA - 90 tabl. You have problems falling asleep, you do not sleep - you do not have to tire! Just choose this product to improve the quality of your dream. Each serving contains a solid dose of gamma amino-butyric acid (GABA). Convenient supplementation with tablets. The world's highest quality!